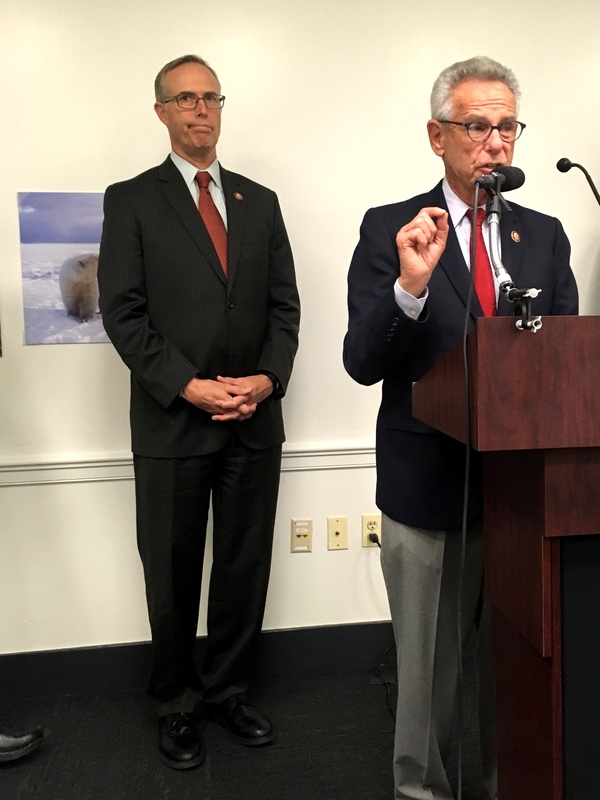 Rep. Jared Huffman, left, sponsored a bill to close the Arctic National Wildlife Refuge to oil drilling. Rep. Alan Lowenthal, right, is a co-sponsore. Photo: Liz Ruskin. In the U.S. House, opponents of development in the Arctic National Wildlife Refuge filed a bill Monday that would end the possibility of drilling in the refuge. “It is time for this administration to listen, and regardless of what they do, we are speaking out, and we are not going to let this happen,” said one of the bill’s co-sponsors, Rep. Alan Lowenthal, D-Calif. The bill has 101 co-sponsors, including one Republican: Rep. Brian Fitzpatrick of Pennsylvania. The bill would delete the section of the 2017 tax law that opened the door to drilling. Its chances are comparatively good in the House, but dim to non-existent in the Senate. Prime sponsor Jared Huffman, D-Calif., said he’s not thinking about that. Huffman said the administration is in a hurry to hold a lease sale, because once oil companies have a property stake in the refuge, it will be more complicated to close the area to drilling. Environmental groups hope to make the refuge an election-year issue. League of Conservation Voters President Gene Karpinski said the bill will “sharpen the conversation” in Congress. He said polling his organization conducted last year, in 26 districts that had a close House race, shows Americans want to protect the refuge. Political science research has shown that public opinion on ANWR can vary dramatically, depending on how the question is asked.